Azalea is a handsome backdrop plant until it blossoms in spring with a spectacular show of color, even in shady areas. The rest of the year these shrubs can create a nice, full hedge or work as an accent in a mixed bed. You can group ones of the same color blossom or plant a variety together for a showy mix of color. Blossoming often begins in late February or early March. Dwarf and semi-dwarf varieties blossom on and off all year but the full size plants are content with being classic and beautiful spring flowering shrubs. You might want to plant both sizes for more year round flowers...and they all like similar planting conditions. 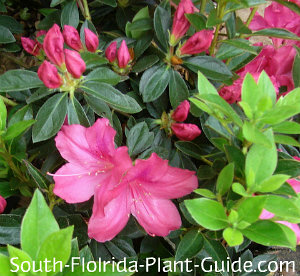 These are cold-hardy plants that actually prefer the cooler locations of South Florida. They'll flower anywhere - sun or shade - but keep a fuller form when they get at least some sun. Most plants prefer an acidic soil, but with azaleas it's an absolute necessity. Because of this, don't even think about using these plants near the beach. The alkalinity of coastal soil is a death sentence for an azalea. Also avoid locations near walks, drives or foundations where concrete can leach into the soil. These plants do best in Zone 9B or areas of Zone 10A that border 9B. They're evergreen fast growers that can be kept 3 to 4 feet tall when young, 4 to 5 feet once mature. This is one of a short list of plants that can handle "wet feet" - an area that stays moist after a rain - so it's a good choice for a homeowner with this landscape issue. These shrubs will grow in full sun to full shade - though in dense shade they may become somewhat leggy (but will flower there). Add Canadian sphagnum peat moss to the hole when you plant. Then fill the hole with water and work the moss with your hands till it absorbs the water. Canadian peat lowers the pH and helps keep the shrub's roots moist. 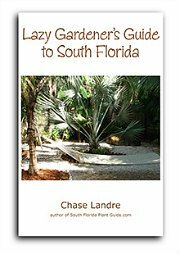 These shrubs have a fibrous root system, and if you plant without loosening the roots, the plant may not make it. Cut an X across the bottom of the root ball and very gently loosen the roots before planting. This is not a plant that likes to go very dry - regular irrigation is a must. You can plant with water-retention crystals like Hortasorb (read more on this on the page about Watering) to interplant with other things that like it a little drier. Use mulch to help keep the roots moist, but keep the mulch at least 6 inches away from the plant's base. 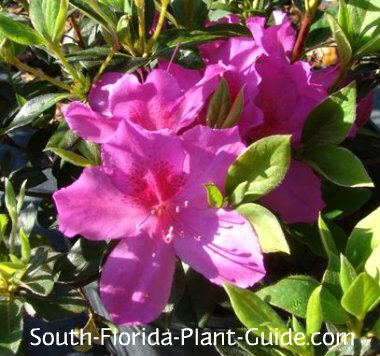 Fertilize after the spring bloom with a granular azalea fertilizer. Apply fertilizer again in late summer or early fall. Do not fertilizer after October 1st - flower buds will fall off before opening. For supplemental feedings between October and spring (or if the leaves are yellowing), apply essential minor elements (EME) to keep the plants green and happy. Lightly prune after flowering and occasionally thereafter till mid-summer. This will keep the shrub bushy and full and not interfere with flower-producing growth for the following spring. Because these plants need acidic soil to thrive, you might want to have your soil tested before investing in a quantity of them. The ideal pH is 5.5 or less for an azalea bush. You can temporarily lower the soil's pH with applications of sulfur or certain sulfates. 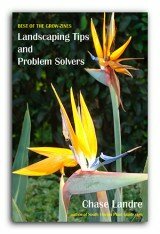 Ask at your local plant nursery for recommendations for a soil-acidifier. However, these treatments don't last. Using these shrubs in your landscaping should depend mainly on whether or not you can place them where they'll have a long and happy life. 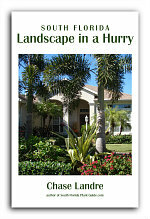 Place these shrubs at least 3 feet apart. They grow wide as they mature, so proper spacing is necessary for them to stay full to the ground. This plant works in a container but growing it in the garden is better. COMPANION PLANT SUGGESTIONS: Blue porterweed, dwarf powderpuff, firespike, star jasmine, heliconia, purple queen, and pentas.